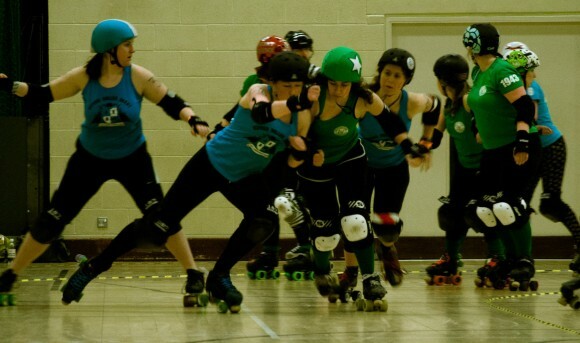 On Saturday 8th February, Nottingham Roller Girls made their debut in the Heartland Series – and what a start it was! For those not ‘in the know’, The Heartland Series is Europe’s largest Flat Track Roller Derby Tournament comprising of 24 different leagues from around the UK – all battling it out in regional divisions culminating in a 2 day final where the winners are crowned Heartland Champions! 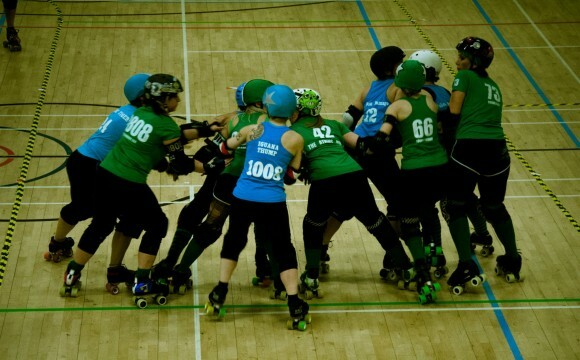 In their opening game, Nottingham Roller Girls faced Oxford Roller Derby who secured 3rd place in the division last year and were sure to bring a challenge to the table. The game seemed fairly evenly matched from the start with the first few jams offering slightly more points to the home team, helped out by high scores from jammer of the day, Hell ‘N’ Back, scoring an impressive 14 points in her first jam of the day. NRG’s lead was short lived when a power jam in favour of Oxford led to a lead change, aided by some offensive blocking skills demonstrated by the away team – particular mention given to French Revolution. The latter part of the first half proved somewhat frustrating for NRG fans, as on several occasions Damndrea successfully pursued the Oxford lead jammer, who tactically called off the jam to avoid losing points: Great strategy on Oxford’s part that didn’t help NRG in their mission to secure more points. NRG managed to limit the points scored by the opposition, however, with some exceptional blocking by The Ruth Hurts and Doodlebug. 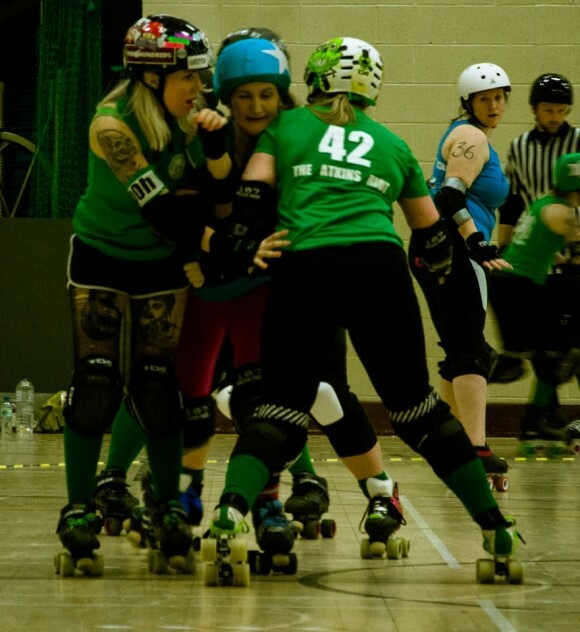 Both blockers managed to contain the Oxford jammer for as long as possible before a brutal hit floored Maths Destruction, forcing her to ‘call it’ from the floor. At the end of the first half, the points sat at 60-82 in favour of Oxford. Whilst a win was not out of reach for NRG, they knew they needed to come back fighting in the second half to regain the points and take the lead. The heat was on. The second half was penalty heavy for both Oxford and Nottingham which meant that at times only one or two blockers from each team remained on the track, opening up the game play. A tactical move by NRG saw jammer B.A. Douglas cut track in the 3rd jam of the second half, gifting a power jam to Louisey Rider who snatched 14 points – and the lead along with it. Oxford didn’t make it easy for NRG with some very strong walls making it a fierce struggle for the home team jammers to penetrate and score points. Some great jamming was seen from Oxford, particularly Maths Destruction and B.A Douglas who refused to concede a win without a fight. Despite Oxford’s efforts to bring back the points, a further power jam for Damndrea, combined with some very strong defensive tactics from The Atkins Riot – who delivered a solid hit to the chest of #1337 – saw the points swing further in NRG’s favour. Good solid walls from Mo, Feartrix and Hades Huntress in her debut bout, supported the team in keeping a hold of the lead. With a final score of 189-144 the bout was a close fight throughout with strong commitment from both teams to the final whistle. An exciting game for everyone to watch! Having secured the first victory, Nottingham Roller Girls look forward to the next round of the Heartland series hosted by Wolverhampton on May 17th. If you can’t wait that long; catch NRG in their next away game at Leeds Roller Derby on February 22nd, or the Brollers in their first game of the year, away at Barrow Infernos on February 15th. This entry was posted in Bout Reports by Kat Chmee (ed). Bookmark the permalink.